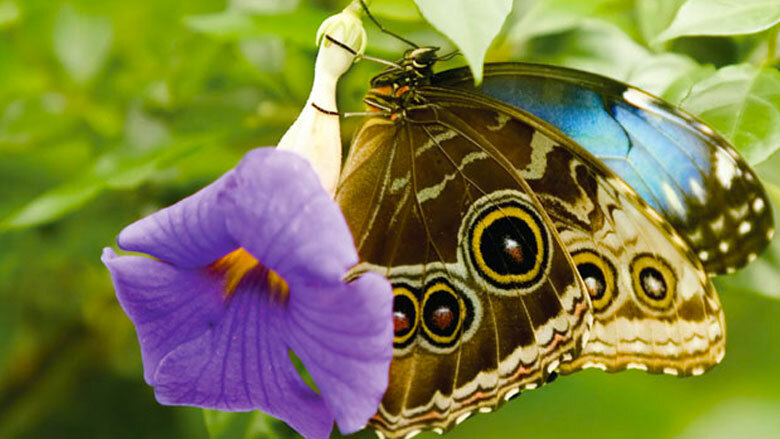 Among the largest butterflies in the world, the blue morpho is severely threatened by deforestation of tropical forests and habitat fragmentation. Yet these and other tropical butterflies may hold the key to discovering pharmaceuticals that will benefit humankind. La Tirimbina, Sarapiqui, Costa Rica—As I walk along a narrow path, slicing through the tangle of vines bordering the stately tropical rainforest here, shafts of sunlight reflect from rain-slick leaves and highlight the aerial dances of butterflies everywhere I turn. At first, I notice the showiest species—medium-sized or large butterflies with wings adorned in vibrant colors, a striking contrast to the backdrop of lush verdancy. But as I stand quietly in the morning sun that streaks down through the forest canopy, I begin to notice the scores of smaller-sized butterflies darting amongst the webwork of vines and about my feet. With my insect net I am able to catch a few of them—some species in subdued earth tones of gray and brown are small, others large and spectacular in color. What I discover along this short stretch of path is but a preview of the much bigger, more complex story of insect and plant relationships in this biologically rich habitat. The rainforests of Central and South America host the world’s richest faunas of butterflies, moths, and other plant-feeding insects. These forests teem with thousands of species of butterflies packaged in many different sizes, shapes, and colors—all part of the unique assemblage of interdependent life-forms that have been molded by longstanding evolutionary forces. Butterflies here include the giant iridescent blue morphoes; the small, brownish wood satyrs and skippers; and the amply represented swallowtails, nymphalids, danaids, and others—all adding splashes of vibrant color to a canvas of green vegetation. This diversity among butterflies is no accident, but rather the result of long, uninterrupted periods of evolutionary innovation and adaptation. The rich cornucopia of wing colors, patterns, and habits of these butterflies is part of the tropical rainforest’s attraction to eco-tourists and natural history buffs. But beneath the beauty is a compelling story about how butterflies, moths, and the plants they eat have coevolved in important ways that not only maintain the balance of this incredible ecosystem but also create unique substances that can benefit humankind. Before they become butterflies or moths, leaf-munching caterpillars take part in one of nature’s most intensive balancing acts—feeding on food plants with which they have coevolved. Yet these food plants for the caterpillars contain substances that can poison other insects in search of a meal. Discoveries of these naturally occurring, biologically active substances have led scientists to re-think their understanding and treatment of various human diseases, and have heightened our awareness of the crucial, unique role of tropical rainforests in our lives. Nowhere else on Earth is this fine-tuned ecological struggle between plants and their “grazers” more intense, largely because the proliferation of plant and insect life is so great and diversified. Covering less than 2% of the total surface area of our planet, the world’s rainforests are home to 50% of Earth’s plants and animals. A typical four-square-mile patch of rainforest contains as many as 1,500 flowering plants, 750 species of trees, 400 species of birds, and 150 species of butterflies. Insects comprise 95% of all terrestrial animal life, and tropical rainforests are the perfect habitat for them; dense and diverse plant life captures and mobilizes vast amounts of the sun’s radiant energy, which, through photosynthesis, is transformed into living plant tissues rich in nutrients for hungry insects. Through their leaves, tropical plants synthesize their primary nutritive substances required for growth and making flowers, fruits and the seeds they contain. Caterpillars exert a tremendous “grazing pressure” on these leaves, a potent force that, without the intervention of specific biological “smokescreens” in plants, would decimate the rainforest. These smokescreens have been developed over a long period of evolutionary time. Each of the many thousands of tropical plant species produces its own unique array of physical barriers (such as coarse hairs or thick leaf cuticles) as well as noxious chemical defenses to thwart the onslaught of plant-feeding insects. Called secondary plant substances, these noxious chemicals serve no nutritive role in the plant’s survival. Rather, they are specifically developed to mediate the tug-of-war between plant and animal that would otherwise end with the plant losing most if not all the nutrient-rich tissues required for growth and reproduction. This stabilization of the rainforest’s complex ecology was shaped over thousands, if not millions, of years of evolutionary experimentation. Thus the vast array of biologically active substances synthesized in rainforest creatures is a product of both this habitat’s past and present. Because of this, when the rainforest goes—and it is being destroyed at a rate of at least 80,000 acres per day—it cannot be readily replaced. The evolutionary slate that produced it in the first place is wiped clean, much to the long-term disadvantage of humankind. The quest for energy ultimately shapes the elaboration of all species and their adaptations. Without a full complement of leaves, a plant cannot photosynthesize at full capacity and suffers a loss of energy. Thus living plants divert some portion of their energy for the synthesis of defensive substances to deter insect attacks on photosynthesizing leaves and other tissues. These noxious secondary plant substances often vary from one plant species to the next, endowing the tropical rainforest, which supports a prodigious number of plant species, with an immense store of novel pharmacological substances—few of which have been explored by modern science. Converse to what is typical of life at the higher latitudes where insects are less ecologically specialized, rainforest insect grazers have more refined and limited palates. Thus, each species of rainforest plant is attacked by only a handful of insect species. Some rainforest plants are more “resistant” to insects than others, the strongest species possessing more effective arsenals of chemical weaponry. The plants with the most effective arsenals in particular hold the greatest potential for research, discovery, and human application. In spite of powerful chemical weaponry to deter caterpillars and other insects, virtually all rainforest plants are fair game for a small slice of the total insect fauna. Each species of butterfly, for example, has evolved its own countermeasures—the capability to penetrate the chemical defense system of one or more plant species, typically members of the same family of plants. Often defensive plant substances, while effective in screening out or slowing down many caterpillars, have evolved into feeding attractants for other insects. Vulnerability to insects is then largely a matter of plant flavors, a balance between repellency and attraction, depending upon the plant species and the butterfly species. A few examples of the highly specialized interfaces between butterflies and their caterpillar food plants will illustrate the nature of these important relationships and their secondary plant substances. For instance, some “pharmacological swallowtails” feed as caterpillars on deadly toxic Dutchman’s pipe vines of the Aristolochiaceae family. The defensive substances of these plants are aristolochic acids, which have been used in medical research to explore the physiology of cardiac arrest and respiratory failure in laboratory animals. The potential of these secondary substances as biological insecticides has also been studied. A consequence of caterpillars feeding on these vines is that as mature butterflies they are distasteful and poisonous to their natural enemies. Lizards and birds learn to avoid these insects by recognizing the vivid “poison warning” color patterns displayed boldly on their wings. Another group of slender-winged rainforest butterflies, the Heliconiines, graze as caterpillars on Passifloraceae or passion flower vines. Sets of defensive alkaloids different from those of the Solanaceae, as well as cyanogenic glycosides, make passion flower vines—as well as some species of this butterfly group—highly unpalatable. The substances found in the highly diversified Passifloraceae offer scientists opportunities for discovery of novel enzyme actions and biomedical compounds. The danaine butterflies, which include the familiar monarch and queen butterflies found chiefly in North America, attain a high level of diversity in the American and African tropics where they lay eggs exclusively on plants in the pantropical milkweed-dogbane family. The caterpillars of these “milkweed butterflies,” as the group is called, feed on these plants, sequestering in the process the highly noxious cardiac glycosides. As with other butterflies mentioned earlier, these poisonous substances are passed on through the butterfly’s life cycle into the adult stage, rendering the insects distasteful to their natural enemies. Cardiac glycosides and their synthetically produced mimics have been used to study the effects of toxins on the mechanisms of heart muscle contraction in laboratory mice. The dazzling blue-winged morphoes, among the rainforest’s biggest, showiest butterflies, are unfortunately known to many of us from the use of their pressed wings in coffee table tops, serving trays, and bric-a-brac. Morphoes caterpillars feed on certain species of legume trees and woody vines. The seeds of these plants contain suites of potent free-standing amino acids that repel insect attack. Quite possibly the leaves also contain the same or similar insecticidal substances, preventing all but coevolved insects (such as morphoes caterpillars) from feeding on them. One of the amino acid anti-feedants in the seeds is L-dopa (L-3,4-dihydroxyphenylalanine), which has been effectively used in the treatment of Parkinson’s disease, and which has also spurred research on how “dummy” neurotransmitters function between synapses in brain cells. Potent naturally-occurring toxins or repellants in many tropical forest plants is evidence that these substances, which have little or nothing to do with the plant’s nutrition, have developed in response to evolutionary grazing pressures from caterpillars and other plant-feeding insects. Butterfly and moth grazing pressure, in particular, has been the sine qua non ecological force promoting the tremendous evolutionary diversification of plant life found in these biologically-rich habitats. Under constant pressure from caterpillars, plants evolve new counter defenses and even evolve new species that are less prone to insect attack. Tropical plants’ genetic versatility, promoted and maintained by a riotous smorgasbord of specialized breeding systems, drives this evolutionary experimentation—spinning off new, naturally-occurring pharmaceuticals in the process. Deploying basic techniques of organic chemistry and biochemical synthesis, scientists specializing in natural products have extracted from leaves, stems, fruits, and other living tissues of rainforest plants their unique chemical attractants and repellents, and have chemically characterized them for many applications. Without nature’s diversified, ingenious chemistry suggesting new paths of scientific exploration in medicine, agriculture, and industry, the search for new commercial and experimental compounds would be much less productive. For example, the flavors and fragrance industry has benefitted immensely from the creativity of tropical nature, not so much in the antagonistic, competitive arena of combat between insects and plants, but in the cooperative interfaces of pollination and mammalian and bird dissemination of fruit and seeds. Floral fragrances arising from diverse recipes in the pollinating flowers of rainforest plants draw in pollen-gathering insects and nectar-seeking birds, bees, and, of course, butterflies and moths. The attractive flavors of fruits ensure the dispersal of seeds by animal life. Much of the flavors and fragrances now synthesized in the industrial laboratory for the food and cosmetic industries started out with the “formulas” of natural plant compounds. And only the surface has been scratched. We know about the ecological chemistry of only 10% or less of the world’s fast-shrinking tropical floras. Since, collectively, scientific studies of tropical plants and the creatures interacting with them have revealed more than 10,000 unusual natural products, we know there must be much, much more to study and understand of similar substances in these forests. They hold great long-term promise for cutting-edge scientific discoveries in biomedical research, specialty enzymes, and agro-ecology. So much so that the National Cancer Institute recently commissioned a long-term study of plant species containing possible anti-tumor substances with a focus on tropical floras. But time is running out for the rainforests and their butterflies due to tropical deforestation that continues at an alarming rate. Originally, 6 million square miles of tropical rainforest existed worldwide. Today, as a result of deforestation, only 2.4 million square miles remain. Can we afford to witness their continued destruction and the loss of—among other things—new pharmacological knowledge of great benefit to humankind? The strategies and justifications for preserving the world’s quickly disappearing rainforests and other fragile habitats must include an argument for protecting their promise of new pharmaceutical knowledge, which might be directly translated into applications that improve human health. While this is certainly not the only reason for saving rainforests, it is a very real and provocative one.